The Best Journey with Bali Driver services to Tibumana Waterfall. Bali known over the world with its cultural culture, warm people and has a very unique culture and tradition, you won’t find at other island of Indonesia. Instead of that, Nature tourism is highlighted of Bali, in addition to offering coastal nature with a variety of beautiful beaches, mountain chain with Mount Batur and Agung Mountain, Bali also offers the natural beauty of waterfalls, that is as an alternative destination for your tour in Bali with our Bali Driver services. Waterfall in Bali is more dominated by the tourist area of North Bali or Buleleng Regency, some in Tabanan Regency, and also at West Bali of Jembrana Regency, but if you want visit the waterfall with close distance from Bali Airport or from Ubud, now you can rental a car with Experience driver to visit Tibumana waterfall located in Br. Build Lemah Kawan, Apuan village, Kec. Susut, Regency, Bangli. The location is included in the Central Bali tourist area, more adjacent to the Ubud tourism center. Hearing about Tibumana waterfall attractions, maybe the recreation area is quite foreign to you, even for Balinese residents, they mostly not know the location of this spot, but with growth of internet in Bali, all tourism spot now can access easily, Tibumana waterfall has indeed been around for a long time but its existence is quite isolated, so access to this place is quite difficult. But today in the era of modern communications that are all sophisticated, it is very easy to disseminate and find information, there is no place that can not be reached and hidden fro us, the world of the internet can go everywhere as if without limits, if you rent bike, you can use Google map and find it easily. The terrain to the location is quite challenging, it requires a little extra struggle, but as my visit on this week, we saw some old people can come down here, while it is advisable not to visit during the extreme raining day, because the road to the location will be slippery, and landslides are prone to landslides, so it can be quite risky for the visitors. Bangli Regency has Kintamani tourist attraction as one of the main recreational spots and most famous tourist destination in Bali, besides that there is Mount Batur as a hiking destination and Hot spring pool down of the foot of the volcano. Bangli Regency also has other tourist attraction like Penglipuran traditional village, Kehen Temple, Cepung Waterfall and now we have another attraction like hidden pearl, called Tibumana waterfall, and this is completing Bangli as tourist destination which is you can visit, if you take our Bali Cab Driver to discover this Regency area, and if you more time, you may discover Terunyan Village which is located across of The Lake Batur. 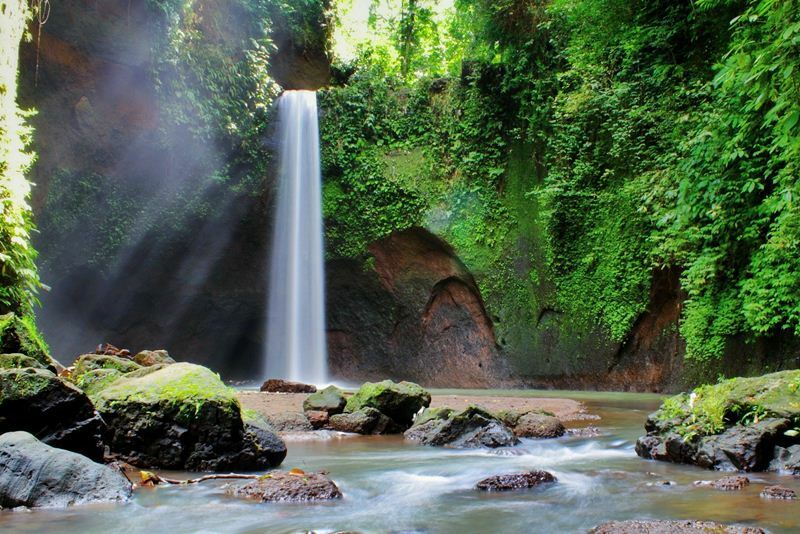 Tibumana waterfall, looks always beautiful at any time, depending on the water conditions and season in Bali, there are two water flows, located side by side, which is offering a beautiful natural scenery, that’s why it is also known as twin waterfalls depend on present conditions on your visit. The water flow of the two waterfalls is not always the same, one of which is sometimes smaller and even stops flowing, so sometimes we can see a pair of waterfalls and sometimes only one waterfall. In certain seasons such as during the rainy season the water flow of the two waterfalls is more stable. Around this tourist spot, the nature is still calm and still virgin, untouched, presenting a feel of peace, perfect for calming down, refreshing and distancing yourself from the hustle of the city. If you want relaxed here, you can roll small mat beside the river. The height of Tibumana waterfall is in a curved cliff area like being in a circle, about 20 meters behind the waterfall there is a narrow cave, according to the story from the local, that is said to penetrate into Goa Raja in the Besakih temple area, but no one has proven the truth. Tibumana waterfall used to be for bathing places, even a place to change clothes had been made. However, because the place is considered a no-nonsense bathing place, visitors are not permitted to bathe here, and by residents to be sacred. But some tourist take bath here and look after by the local security of life guard from the village, please follow his order at any time for your safety. The shelter under the waterfall also looks quite deep, as seen with the dark blue water below it indicates quite deep. The meaning of the word “tibu” means a deep riverbed or trough. The surrounding nature is beautiful, the trees grow shady, shrubs are seen clinging to the cliff walls, cliffs around the waterfall are overgrown with moss. If your visit heavy rain, please be aware with land slide around the cliff. The distance of Tibumana waterfall from Bali Airport is about 1,5-2 1.25 hours drive, subject on the traffic conditions. If you ride a bike, then park at front of the Dalem Temple, then follow the instructions for access to the waterfall, through the side of the temple the journey continues, with an entrance ticket of IDR 15,000 / person. If you saty in Ubud center, its take about 35-45 minutes drive through the path then two wooden bridges, so that they still look natural, traveling in the shade of trees, watching the clear river flow and natural cliffs, this is no less exciting than other trip. Once you come back from your visit, you may stop at local food stall located near the Temple or parking area, they served fresh coconut, beer, coke and other drinks, if you want try local food, then you may order Bakso or Tipat cantok Balinese food, or just order cup of coffee, relaxing sitting and enjoy the rice fields view. If you have any tour idea to visit Tibumana waterfall and combine with other sightseeing tour, please feel free to contact us to get some tour suggestion from BaliCabDriver staff.